Our next SoHo General Meeting will be held on Monday, April 8th in the Fremont Library (Melrose/June) beginning at 6:30pm. The South Hollywood Neighborhood Association is a group of community-engaged people with a vision for their neighborhood. We are proud to live in this one-of-a-kind area and are committed to preserve the esthetics and history of this district. We invite you to join us and participate in community meetings, discussions and events! All members are welcome to submit items to the Agenda. Items must be submitted by the Friday before the meeting and will be included if time permits. If you want to submit an agenda item, please click here, or click contact us at the contact page. OUR NEIGHBORHOOD ASSOCIATION IS HERE TO EMPOWER NEIGHBORS TO GET THINGS DONE THAT IMPROVE THE NEIGHBORHOOD FOR US ALL. Any member is welcome to attend any meeting they want. Members are also welcome to join committees at any time. We only send Committee and Board meeting reminders to those who sign up for those committees. Meetings are generally held the 2nd Monday of each month beginning at 6:30PM in the Fremont Library at Melrose/June. Some have been re-scheduled based on Holidays or availability of the Library. All meetings are located at the Fremont Library, 6121 Melrose Ave. We will notify you of any changes! If you would like to donate, please see our fundraising page! Click Here! And, you can donate through PayPal also! 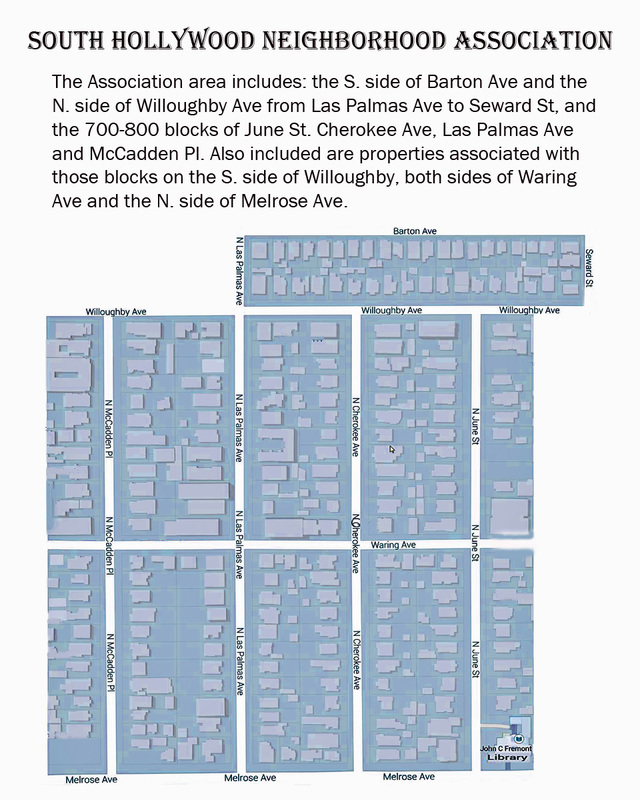 The South Hollywood Neighborhood Association consists of residential property owners and renters within the boundaries as shown on the map.